Although snoring is often the subject of jokes, it can be serious. 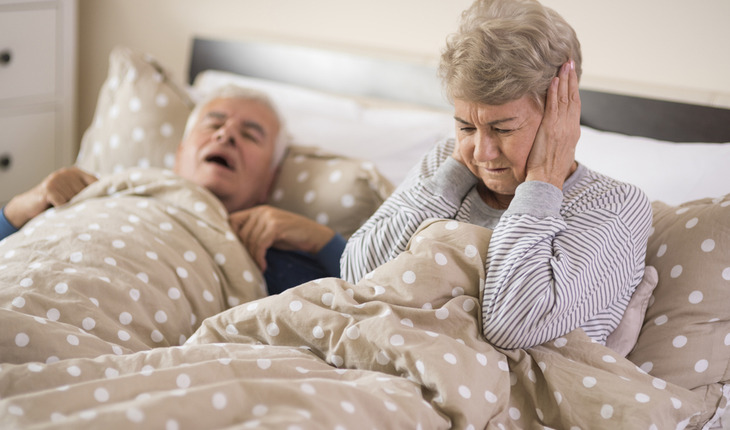 Snoring affects up to half of adults, according to the Mayo Clinic. Snoring occurs when air flows past the relaxed tissues in your throat and causes the tissues to vibrate as you breathe. Some devices and even surgery can help. But, the Mayo experts caution, these aren’t right or even necessary for everyone who snores. Lose weight if you are overweight. People who are overweight may have extra tissues in the throat that contribute to snoring, Mayo says. Sleep on your side. If you lie on your back your tongue fall backwards into your throat; that narrows your airway and partly obstructs airflow. Mayo suggests that if you find you always end up on your back, despite trying to sleep on your side, try sewing a tennis ball in the back of your pajama top. Raise the head of your bed about four inches. Use nasal strips or an external nasal dilator. Adhesive strips applied to the bridge of the nose help many people increase the area of their nasal passage, enhancing their breathing, Mayo says. A nasal dilator is a stiffened adhesive strip applied externally across the nostrils that may help decrease airflow resistance so you breathe easier. But, Mayo cautions, these devices are ineffective for people with sleep apnea. Treat nasal congestion or obstruction. Having allergies or a deviated septum can limit airflow through your nose. This forces you to breathe through your mouth, increasing the likelihood of snoring. Don’t use an oral or spray decongestant for more than three days in a row for acute congestion unless directed to do so by your doctor. Ask your doctor about a prescription steroid spray if you have chronic congestion. If you have a structural defect in your airway, such as a deviated septum, you may need surgery. Limit or avoid alcohol and sedatives. Avoid alcohol at least two hours before bedtime, and tell your doctor about your snoring. Sedatives and alcohol depress your central nervous system, causing excessive relaxation of muscles, including the tissues in your throat. Get enough sleep. Adults should aim for at least 7 to 8 hours of sleep per night.